If you're looking for a budget-friendly gift to your love ones or to yourself, check this out! Cherry Mobile is having an early promo for 2014 graduation. For every purchased of the 3G tablet, Cherry Mobile Superion Core, you can get a free Cherry Mobile W1 for only P6,499. The Superion Core features a quad-core MediaTek MTK 8389 processor running at 1.2GHz, 1GB of RAM and a 7-inch capacitive HD IPS display. 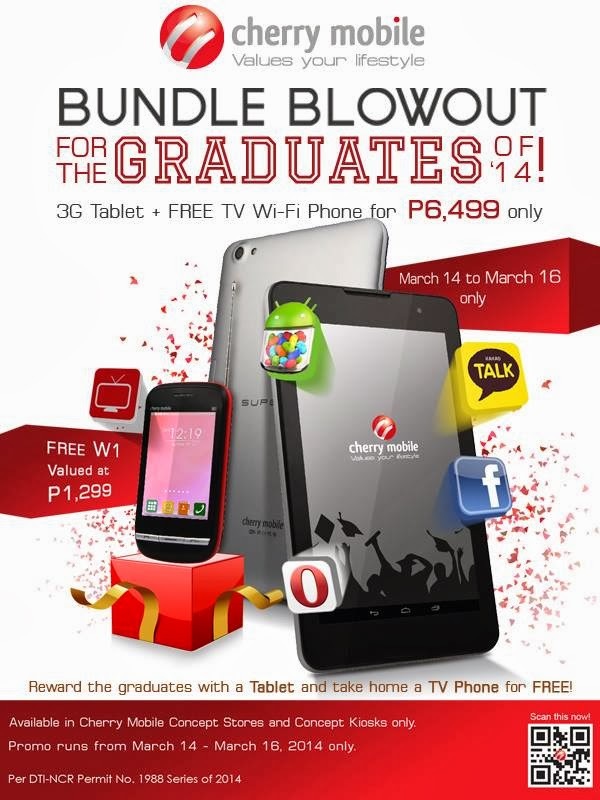 Bundle Blowout for the Graduates of '14 is available in Cherry Mobile Concept Stores and Concept Kiosks from March 14 - 16, 2014 only.